Description: Updated for Version 5 and Adobe plug-in workflows. 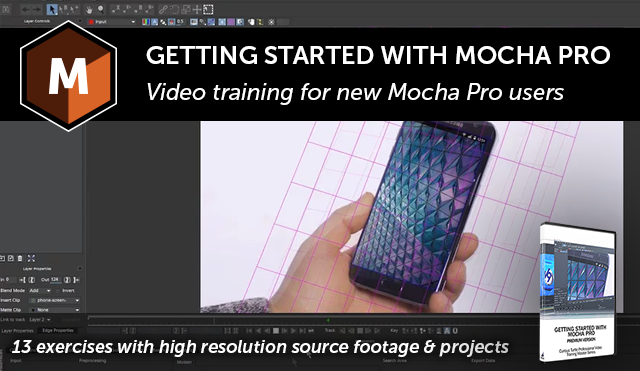 This downloadable training series contains 4 hours of essential training to help users get up-and-running with Mocha Pro‘s interface and tool set. Perfect for a beginner or any Mocha user who wants to work more quickly. Ben Brownlee, VFX artist and master trainer (Curious Turtle), guides users through the basics of Mocha‘s powerful tools – Planar Motion Tracking, Advanced Roto & Masking Tools, Object Removal, Image & Camera Stabilizer, Screen Inserts, 3D Camera Solver & more. Exclusive extra tutorials putting your skills into practice. Instant Download includes a single download file version (approx 2.8GB) or a multi-part option for less stable connections. Once you’ve mastered the basics, you will be ready to tackle our other, more advanced Mocha training. So you can tackle bigger, more complex tracking, rotoscoping and paint jobs. This tutorial covers the basic idea, which is fundamental to all aspects of Mocha Pro: Planar Tracking. You will see how to choose your area for tracking and what makes a suitable shape. Limitations of the planar tracker. What can’t you track? This tutorial covers one of the most common tasks for Mocha Pro – a screen replacement. You will also see how to correct drifting tracks using the AdjustTrack module and what not to use this for. AdjustTrack Keyframing AdjustTrack over time. This tutorial breaks down the parameters in the Mocha’s Tracking module. This lets you understand how to get the most accurate tracks the first time out. 05 – Unlink Tracking. Tracking camera movement the smart way. This tutorial features one of the most simple and powerful techniques for using Mocha’s planar tracker to track camera movement: Unlink Tracking. 06 – Using the tracking data. Matchmoving, corner pins and more. Now we have tracked our footage in Mocha Pro, it’s time to use this data. We look at getting the data out of mocha into multiple host applications. We also see a couple of caveats and how to manipulate the data prior to export. We take an extended look at using our tracked mocha data, and using it to stablize footage. We work with the data directly, then see how to use mocha Pro’s Stabilize module to get even better and more customizable results. Where is the best place to track for stabilization? 08 – Rotoscoping Basics An in-depth overview of basic rotoscoping in mocha Pro. This tutorial will give you the tools to get started with roto projects using mocha’s tracking data as a driver to speed up the task. This tutorial gets into more detail about doing screen inserts in Mocha Pro. We take a look into the Insert module and see how to manipulate the insert on a curved screen in more advanced ways; including warping, blurring and hold-out mattes. The aim of this tutorial is to get comfortable with the Remove module in Mocha Pro. We start slowly, getting the basic idea of removing foreground layers in mocha. The exercises get progressively more complex as we work through them. 11 – The Lens Module This tutorial gives you an overview of the Lens module in mocha Pro to correct for lens distortion in your footage. 12 – Camera Solve : Pan / Tilt / Zoom This tutorial for mocha Pro focuses on creating a 3D Camera Solve using the planar tracker. We look at the pitfalls of tracking for longer panning shots and how to get the right result. 14 – Putting it together. “The Gum Shot” The first of our practical projects, where we put much of the previous work together into a single shot. This builds on our rotoscoping and how to most effectively roto a rotating pack shot out. We see the speed and practical advantages of recycling the tracking and shape data for multiple purposes, as we finish the shot in Adobe After Effects. 15 – Putting it together. “The Floating Phone” The second of the practical projects. This is our first look at removing objects in the scene, using a combination of clean plates, 3D camera solves and rotoscoping. We work with some more complex interactions between shapes and how to use them to achieve the correct results. Or, stream Getting Started with Mocha for free (does not include footage and project files).